Located in Howell, Michigan, Site Specific Inc. provides tree care services under the leadership of Julie Stachecki Johanningsmeier. With Detroit, Lansing and Ann Arbor forming somewhat of a triangle around Howell, there’s also a fair share of urban forestry work to be done. For her part — and her business’s — Stachecki Johanningsmeier puts her passion for urban forestry to good use well beyond the state of Michigan. Stachecki Johanningsmeier may not seem like your typical arborist. That’s because, historically, only about 10 percent of arborists have been women. But local business owner and tree care expert Stachecki Johanningsmeier doesn’t let that stop her from being involved in the industry. For instance, in September, she presented at ArborFest, the Arboriculture Society of Michigan’s fall conference. In October, she’ll raise awareness and funds for the industry as a rider in this year’s STIHL Tour des Trees. 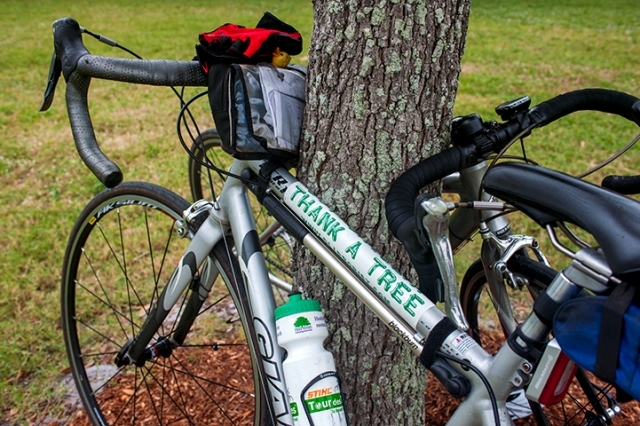 Far from Michigan, the Tour des Trees will take participating cyclists more than 600 miles through North and South Carolina in the span of just one week. Riders in the Tour des Trees sign on not just to go the distance, but also to raise money for a fitting industry organization, the Tree Research and Education Endowment (TREE) Fund. “The fundraising component of the STIHL Tour des Trees supports tree research & education through the TREE Fund,” Stachecki Johanningsmeier says of the event. She sees that cause as a necessary campaign for her and her industry. Stachecki Johanningsmeier will join more than 100 riders from the U.S. and Canada in supporting that cause on the Tour des Trees route. To keep up with their journey, follow along at www.stihltourdestrees.org. Read more about Michigan, STIHL Tour des Trees.